Deadline for avoiding e-prescribing penalty is fast approaching. June 30th will be here before you know it! “Clinicians slow to adapt to digital medicine have until June 30 to electronically transmit 10 prescriptions to the pharmacy for Medicare patients, and thereby avoid a 2% cut in their Medicare reimbursement next year. The 2% penalty is the punitive side of a federal program designed to motivate physicians and other clinicians to replace their prescription pads with iPads, smart phones, and the like. In 2010, the Centers for Medicare & Medicaid Services (CMS) began paying bonuses to clinicians who e-prescribe for their Medicare patients. The bonus that year was 2% of a clinician’s Medicare reimbursement. In 2013, the final year for these incentive payments, the bonus is 0.5%. Last year, Medicare began penalizing clinicians who had not previously qualified as “successful electronic prescribers,” in CMS parlance, or electronically transmitted at least 10 scripts for Medicare patients in the first half of the 2011. That number of e-prescriptions, reported to CMS through G codes on Medicare claims, is not enough to earn a bonus, but it staves off the penalty, which was 1% in 2012. The penalty disappears after 2014. Lacked prescribing privileges and indicated that with code G8644 at least once on a Medicare claim before June 30. PQRS..more than just letters in the alphabet! In all the whorl wind of Meaningful Use Stages one and two, e-RX incentives (or penalties), ICD-10 implementation, there’s another “oldie but goodie” program for providers to participate in. The program has been around for a few years, but did you know come 2015, you may be subject to another penalty (on top of everything else) for not participating in this program? According to CMS- The Physician Quality Reporting System (PQRS) is a reporting program that uses a combination of incentive payments and payment adjustments to promote reporting of quality information by eligible professionals. Beginning in 2015, the program also applies a payment adjustment to eligible professionals who do not satisfactorily report data on quality measures for covered professional services. To earn the 2013 PQRS incentive payment and avoid the 2015 PQRS payment adjustment you need to collect your data from January 1 through December 31 of this year. Decide if you are going to report through your EHR (you may have to discuss with your vendor if you can report through your EHR), or if you are going to report your measure on claims. If your claim with the reporting codes on it was denied for payment the PQRS codes will not be included in the program analysis. Review all diagnoses (if applicable) and CPT Service (encounter) codes for denominator inclusion in PQRS/eRx (i.e., claims that are denominator-eligible). Participation this year in the program could earn you incentives of up to 1%. Failure to report could land you a whopping 1.5% pay cut (in addition to all those other penalties from CMS). Need to learn more? Visit us on the web at www.sunrize.com. CMS also has a new eHealth Website that has some useful information as well- http://www.cms.gov/ehealth. Claims Engine including ERA, Electronic Eligibility Checking & Relay Health EDI. Learn easily and train new staff with integrated training videos, guides, and online help. For additional information please visit our website at www.sunrize.com or call 502-538-4665. Incentive payments made through the Medicare Electronic Health Record (EHR) Incentive Program are subject to the mandatory reductions in federal spending known as sequestration, required by the Budget Control Act of 2011.
payments made to eligible professionals and eligible hospitals will be reduced by 2%. This 2% reduction will be applied to any Medicare EHR incentive payment for a reporting period that ends on or after April 1, 2013. If the final day of the reporting period occurs before April 1, 2013, those incentive payments will not be subject to the reduction. Please note: This reduction does not apply to Medicaid EHR incentive payments, which are exempt from the mandatory reductions. Be prepared for changes to stage 1 meaningful use! You can no longer count an exclusion toward the minimum 5 menu objectives. In other words-there are 10 to choose from and a provider must be able to attest to 5 of those with no exclusions. Seeing patients ages 3 and over? You have to record blood pressure, height and weight on more than 50% of patients. An EP can exclude his or herself, though if there is no relevance to the scope of practice. The capability to exchange key clinical information among providers of care and patient authorized entities electronically is no longer required starting in 2013. Providing patients with timely access to their health information within 4 business days has been changed in 2014 to being able to provide patients the ability to view online, download and transmit their health information within 4 business days of the information being available to the EP. This will have to be reported for more than 50% of all unique patients. LOTS of changes with Clinical Quality Measures (CQM). Prior to 2014, providers have 44 measures to choose from in which they had to report 6 total (3 core and 3 alternate). Starting in 2014 and beyond a provider must report 9 measures (out of a total of 64). Selected CQM’s must cover at least 3 of the National Quality Strategy domains. For more information please refer to www.cms.gov/EHRincentiveprograms. Providers who were early demonstrators of meaningful use in 2011 will meet three consecutive years of meaningful use under the Stage 1 criteria before advancing to the Stage 2 criteria in 2014. All other providers would meet two years of meaningful use under the Stage 1 criteria before advancing to the Stage 2 criteria in the third year. This is regardless of the year you started to participate. Looking forward to stage 2 of meaningful use? Although you can’t begin to collect data for stage 2 meaningful use until 2014, there are a couple of things to have in place ideally before 2014. The first thing is to establish a patient portal and become familiar with the workings of the portal. Work out any changes to your workflow in order to become successful in establishing protocols for staff and for patients. Make sure to give yourself plenty of time for marketing. Another item for action would be to get with your lab (if you haven’t already done so), and make sure your EHR has a way to incorporate lab results as structured data. This menu objective for stage 1 becomes a core objective for stage 2. Creating this “bridge”, can take some time to do so the sooner the better. Some labs are more backlogged than others and this could very well take up to 6 months to complete. Any questions? We’d be happy to help visit our website- www.sunrize.com or email me- Kelly@sunrize.com. McKesson Practice Choice™ is a cost-effective Web-based electronic health record (EHR) and practice management (PM) solution inspired by small, physician practices just like yours. Intuitive and efficient, McKesson Practice Choice does more than maintain records and protect cash flow; it has the power to improve the quality of your patient interactions. With 20+ years developing PM and EHR technologies, McKesson understands the juggling act of the small, physician practice, and is committed to utilizing technology to make your life easier, flexible and more efficient. 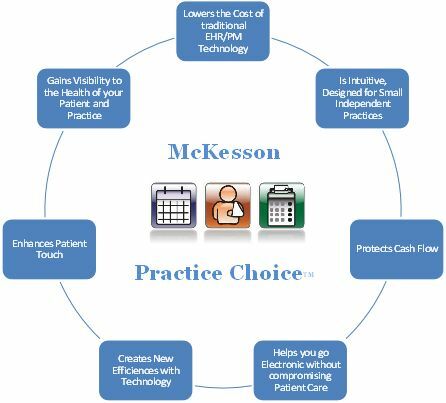 That’s why McKesson Practice Choice is more than an EHR product — it’s a comprehensive, full-practice solution. Utilizing a SaaS (Software as a Service) model, McKesson Practice Choice allows physician practices to exchange data with other practices, patients, HIEs, hospitals, pharmacies, labs and payers. These connections help to streamline care coordination, to enhance patient care, and to position your practice for the future direction of healthcare. Spend less time charting and more time interacting with your patients, as everything you enter automatically flows data into all pertinent fields throughout a chart. data from anywhere in the patient’s chart. McKesson Practice Choice brings needed efficiencies to a busy front office. From a single screen, gauge your progress in real time for both core and selected requirements, and gain an instant view of your practice’s performance. Also, customizable controls allow you to observe detailed performance levels of every member of your practice. Need more information? Call us at 888-880-0384 or visit us on the web at http://www.sunrize.com. Patient portals and stage 2 meaningful use. Although you can’t begin attesting to Stage 2 Meaningful Use until 2014, you may be either preparing to implement or have already implemented a patient portal to meet the patient engagement requirements. Both of these requirements can be easily met through an online patient portal, provided healthcare professionals can convince patients to access it – an easy feat? It is really going to depend on your patient demographics. Don’t judge by age, necessarily. The baby-boomer generation, is just as tech-savvy as any 20 year old today. Look in your waiting room-who is texting on their smart-phones or reading on a Kindle? Those are the folks to market a patient portal to. It’s the “getting the horse to water, but you can’t make it drink” analogy. You can offer it, but how are you going to get your patients use it? Healthcare organizations have petitioned the Centers for Medicare and Medicaid Services (CMS) to remove these objectives from its meaningful use stage 2 guidelines; however, officials have yet to do so. Instead, CMS officials have hinted that the requirements could be revisited should they prove to be too difficult for providers to attest to. In the meantime, look at what your existing EHR has to offer in terms of a patient portal. If you aren’t already paying for this service, the cost to start up a portal is nominal. Start promoting this now to your patients so when you do your attestation in 2014 this will be one of the core objectives that is a “no-brainer” to meet! For additional information, please contact a sales representative at Sunrise Services, LLC. Our toll free number is 888-880-0384, or on the web at http://www.sunrize.com. EMR in the clouds…what does that mean anyway? If I had a nickel for every time someone asks me what SaaS means (and I see you, scratching your head now trying to come up with what that acronym means), I’d be richer beyond my wildest dreams. It means, you would log on to web browser (Internet Explorer, Firefox, Chrome, etc. ), type in a web address, and enter a username and password to access your data. If you file your income taxes, for example, using an online service you are essentially using a SaaS based program. Your practice could be portable in the sense that you could log on anywhere you have an secure internet connection. The disclaimer here is you wouldn’t want to go to Starbucks and run your practice (not secure). Efficient-I think so, but SaaS may not be for everyone. 1. Does your practice have good internet speed? If not, check with your internet service providers to see what is available. Make sure to factor this in when calculating your monthly fees. 2. Does your practice have a reliable internet connection? Speed is one thing, but if you live in an area where the internet connection is choppy, you may want to either consider switching providers or looking at a server-based product. There is nothing worse than not being able to get on the internet to access your charts. 3. Are you a small practice without an IT staff? The greatest thing about having a SaaS based EMR program is that you are not going to be down when your server needs to be upgraded. Keep in mind that not only will your EMR software need to be updated your Windows software will also need to be updated from time to time. Factor in the cost of hardware when considering which way to go. Servers are no immortal-they have a life span like everything else. If you answered YES to all of the above, then having a SaaS based EMR program may save you both money and headaches. Medisoft, makers of one of the most highly regarded suites of medical billing software on the market today, provide a lot more than medical billing software. The company’s practice management software, electronic health records software and billing software combine to provide 360 coverage for all of the needs of your medical or health-related practice. Whatever your practice needs are, Medisoft has you covered. Medisoft EMR and Medisoft Clinical are comprehensive electronic patient records solutions for small to medium-sized practices. Medisoft Clinical v.17 provides all the functionality you need to post, manage and maintain patient records, and meets the federal government’s Meaningful Use requirements as a EHR for both Medicare and Medicaid providers. It integrates patient records with appropriate diagnostic codes and third party billing codes. Easy to install and maintain, it’s an easy way to bring your paper office into the electronic age. From appointment setting to collections, Medisoft helps you track all interactions with patients in one database so that you can easily pull up any information you need to run your practice properly. Your Medisoft installation provides the framework on which your practice depends to run smoothly. Medisoft integration saves time for your office staff and reduces your need for outsourcing tasks such as billing and collections. The Medisoft interface makes it easy for providers to enter patient notes in the way that’s most comfortable for each using Bright Note technology. Once the note is entered, the software disseminates it to every relevant field in the patient’s chart. Because all of the information originates from a central database, there’s far less chance of an error being introduced during transcription of charts and information from charts to billing. In addition, Medisoft is regularly updated with the latest codes and standards so that your billing statements always go out on the right forms with the right codes. The reduction of errors means that your claims are more likely to be paid quickly by insurance companies, Medicare and Medicaid, reducing the amount of work your office staff has to do to follow up on rejected and amended claims. Your practice can also take advantage of patient reminder software by Medisoft. Since it also integrates with your Medisoft installment, your patients will get timely reminders of upcoming appointments, reducing the amount of income you lose to unfilled blocks of patient time. Overall, Medisoft provides everything you need to run your practice smoothly and efficiently – except, of course, your staff.